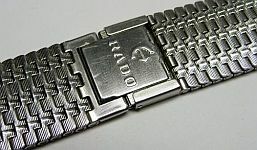 A lot of Rados in the late 1960s, 1970s came on NSA bracelets with Rado-signed clasps. The Novavit SA (NSA) was sited in Carouge, Kanton/federal state Genf/Geneve, Switzerland and was liquidated in 1999. 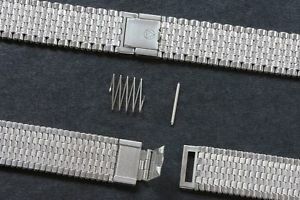 It had been founded in 1947, the business was to produce bracelets for the watch industry with almost blanked parts and also blanked parts for the whole fine mechanic. It seems to have been the family enterprise of a family called Nobs. The company logo is a triangle inner a circle. 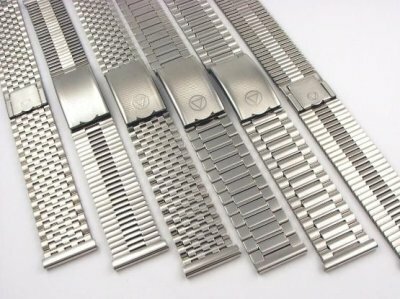 NSA became world famous for their very comfortable high quality watch bracelets, especially for the so called 7-row. This was applied for patent in 1966 and patented in 1967. Probably they also had a patent for their clasps - both, the short and the long (folded) type have a spring mechanic which makes it automatically a bit longer if there´s enough pressure, e.g. in the summerheat, when the wrist swells a bit. I´ve seen 7-rows and 3-rows with signed clasps of a lot of watch companies in Switzerland as Tag Heuer, Jaeger LeCoultre, Rado, Felca/Titoni, Zodiac, Technos, Roamer, Louis Rossel, ... . They also had been available in the aftermarket with NSA-signed clasps. 7-rows had been also produced in USA (Kreisler, under license) and Italy (I don´t know if licensed or for NSA). You can find NSAs in a lot of variations in material (SS, GP, titanium, "bicolour", synthetic material, PVD-coated) and surface design. The company still registered a few patents in the 1980s but finished work in 1995 (finally liquidated 1999). They surely couldn´t compete with production in Fareast and/or missed producing there - or whatever led to the decision to give up. Meanwhile you find 7-rows from Fareast in the aftermarket in "NSA-style". Another lot of Rados in the late 1960s, 1970s came on SK bracelets with Rado-signed clasps - best known the famous Fishtails. But who is SK? 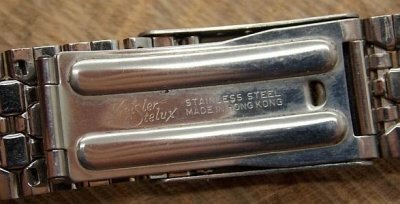 A research about these mysterious SK bracelets leads to a Hongkong sited company, the STELUX MANUFACTURING CO: Ltd., at that time a producer of bracelets for watches. In the late 1970s, they have bought the Solvil et Titus brand and later had a little problem with Rolex about the similarity of watch designs. Today they also own Cyma and UG. And there obviously was/is a relation to the old Stern-Kreisler Jewelry Company, later Jaques Kreisler or Kreisler only as brandname. 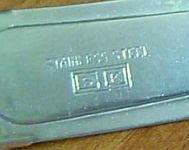 It began probably in a way that Stelux produced for Kreisler first and later bought and integrated Kreisler as brandname. The first bracelets have been produced as Kreisler Stelux, later as Stelux Kreisler = SK. Also possible they reactivated the old Stern-Kreisler name as SK. Today, Kreisler as a brand is integrated in a company called Genal Strap, trading as Voguestrap.
" Kreisler by Voguestrap has been a recognized name in the watch accessories market for over 70 years. The Kreisler Manufacturing Corporation started in 1913 as the Stern-Kreisler Jewelry Company and was dedicated to manufacturing fine jewelry. In 1933, Kreisler began to manufacture watchbands as well. Today, Voguestrap is proud to continue in the Kreisler tradition by manufacturing classic, quality watch winders. Kreisler watch winders feature classic design, silent motors, soft protective leatherette interior, handsome veneer exteriors and are available in various styles and sizes for the novice watch collector to the aficionado. Kreisler is fully committed to the perpetuation of superior service, innovative product design and outstanding customer support. "